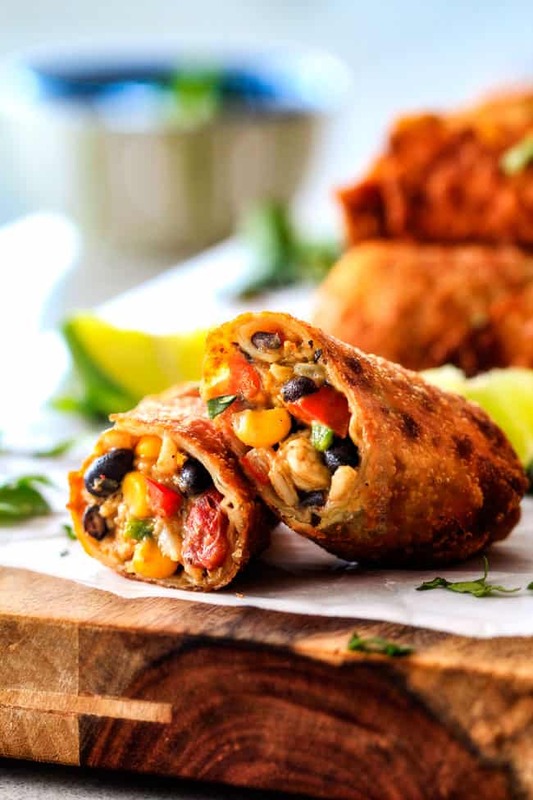 Crispy Fried OR BAKED Southwest Egg Rolls loaded with Mexican spiced chicken, beans, tomatoes, rice, avocado and melty cheese! These Southwest Egg Rolls are your favorite restaurant appetizer that are restaurant delicious and super easy to make at home! They are packed with so much flavor and texture, they not only make a crowd pleasing appetizer, but a scrumptious meal the whole family will love all served with heavenly Cilantro Lime Ranch Dip! These Southwest Chicken Egg Rolls also freeze super well (instructions included), making a convenient make ahead meal, snack or appetizer. What Makes these the Best Southwest Egg Rolls? You know we love good great Mexican food around from my Southwest Salad to Mexican Chicken to Salsa Verde but we also love egg rolls from Philly Cheesesteak Egg Rolls to Sesame Chicken Egg Rolls to Sweet and Sour Egg Rolls, so I created the best of both worlds with these Southwest Egg Rolls! These Southwest Egg Rolls are basically all your favorite Mexican ingredients spiced with smoky, fiestalicious seasonings cocooned in a crispy baked or fried shell oozing with cheese. 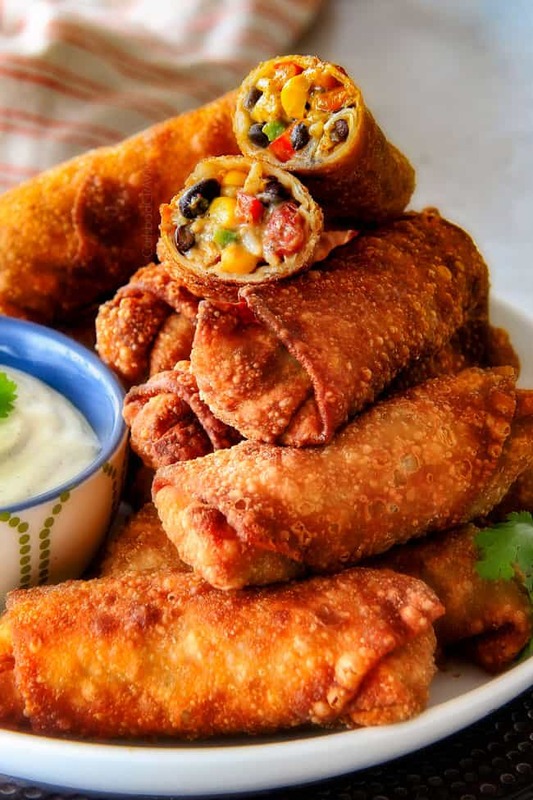 Now there are a lot of Southwestern Egg Roll Recipes out there but what sets these Mexican Egg Rolls apart is the generous addition of cheese and creamy mashed avocados! They envelop the filling so its nice and creamy – no pet peeve dry filling here! To top it all off, the Southwest Egg Rolls are dunked in a creamy Cilantro Lime Ranch Dip that is obsessive worthy. It luscious tangingess cuts through the rich egg rolls and creates the perfect fresh, savory, crunchy, creamy, robust and tangy bite. What Goes in Southwest Egg Rolls? This filling creates my perfect Southwest Egg Rolls but you can completely customize the filling to create YOUR perfect Southwestern Egg Rolls. 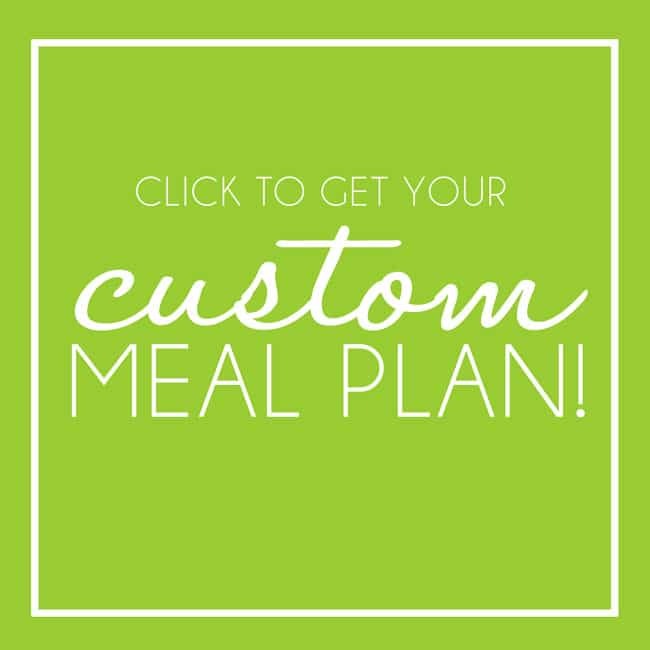 You can use beef instead of chicken, use shrimp instead of chicken, use white rice instead of brown, swap out the Cheddar/Monterrey Jack cheese for Mexican Cheese blend, use more or less of your favorite ingredients, etc. If changing the filling, just be sure to add less/more avocado according to your changes. 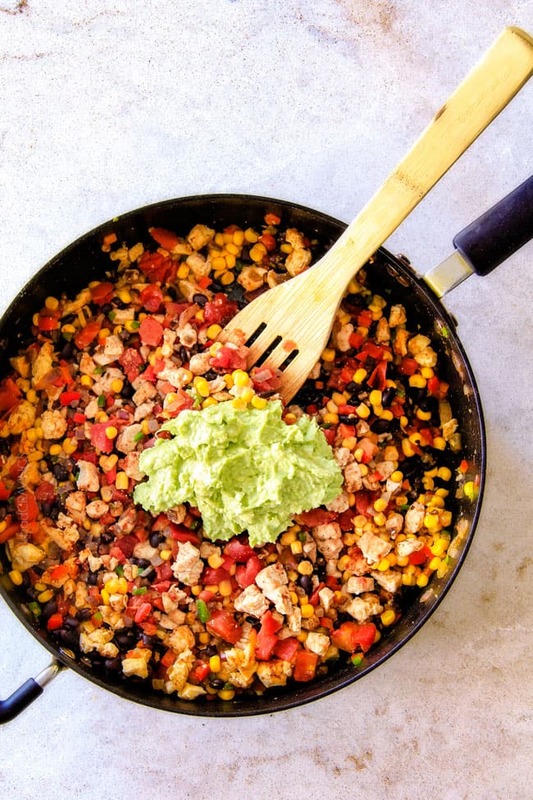 For example, if you decrease the other filling ingredients or omit the rice then you will want to use less avocado so the creaminess doesn’t overwhelm the rest of the ingredients. Absolutely! 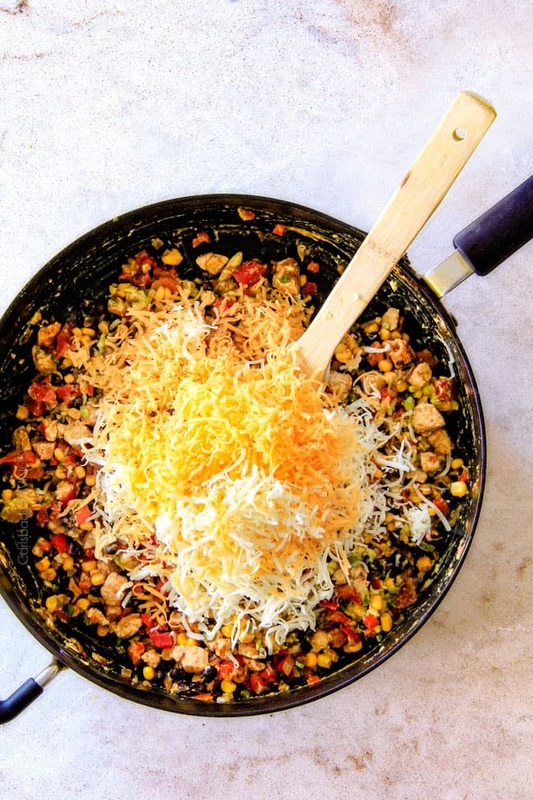 You can either used shredded rotisserie chicken or chopped up leftover chicken. Add the cooked chicken to your pan when cooking the bell peppers. 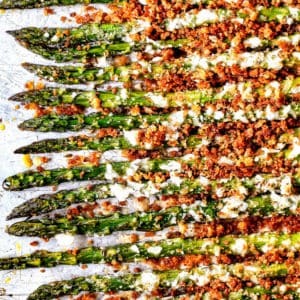 If you’re feeling extra lazy, you can skip the onions and garlic and use powders instead. Can I make these Southwest Egg Rolls Vegetarian? Yes! Simply omit the chicken and and either increase the other ingredients or use less avocado so the filling isn’t swimming in creaminess. HOW DO YOU MAKE SOUTHWESTERN EGG ROLLS? Southwest Egg Rolls starts with the filling all made in one pan! First, cook your chicken and onions then add your garlic, bell peppers and jalapeno and sauté 1 minute. 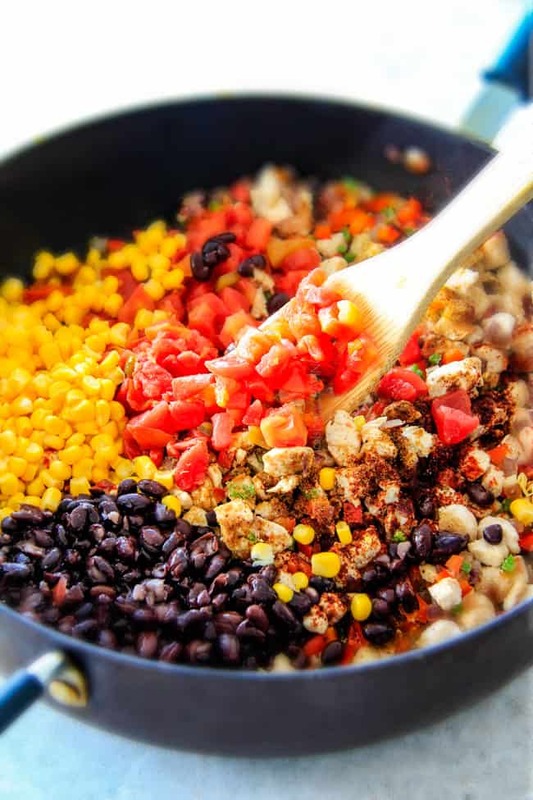 Stir in black beans, corn, rice, tomatoes and all seasonings and warm through. Finally, get cheesy! Stir in the cheeses until melted followed by the avocado. How you Fold Southwest Egg Rolls? Step 1 – Prepare Surface: Line your counter with parchment paper to place rolled egg rolls if frying or line a large baking sheet with aluminum foil if baking and lightly spray with nonstick cooking spray. Keep egg roll wrappers covered when you’re not using them so the don’t dry out and crack. Step 2 – Add Filling: Position an egg roll wrapper with one point towards you. Place 1/4 cup filling centered in the bottom third of the wrapper. Step 3 – Fold: Fold bottom corner over filling then continue to roll up, firmly folding sides toward center over filling as you roll. Make sure you push out any excess air and roll your egg roll as tightly as possible to prevent the filling from leaking into the oil and the egg roll cracking. Step 4 – Seal: Moisten top corner with water and press firmly to seal. Repeat with remaining wrappers and filling. If your egg roll isn’t properly sealed, it will leak when cooking, so make sure it’s secure! 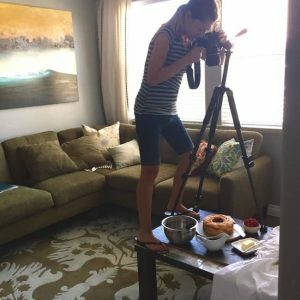 Can you Make Southwest Egg Rolls in Advance? You can either freeze Southwest Egg Rolls or partially make them in advance. but do not assemble and refrigerate without cooking or else the wrappers will become soggy and tear. To pep in advance, you can make and refrigerate the filling up to 3 days in advance – minus the avocado. When ready to serve, warm up the filling, stir in the avocado, assemble and cook. Do I have to Use all of the Filling for Southwest Egg Rolls? This Southwest Egg Rolls recipe makes a generous 21 egg rolls, plus or minus, depending on just how full you stuff your egg rolls. The egg rolls go quickly at our house so we don’t hesitate to make all of them but you certainly don’t have to. The leftover Mexican chicken filling can be used in countless ways from filling in tacos and burritos, to serving as a dip or on top of a salad. 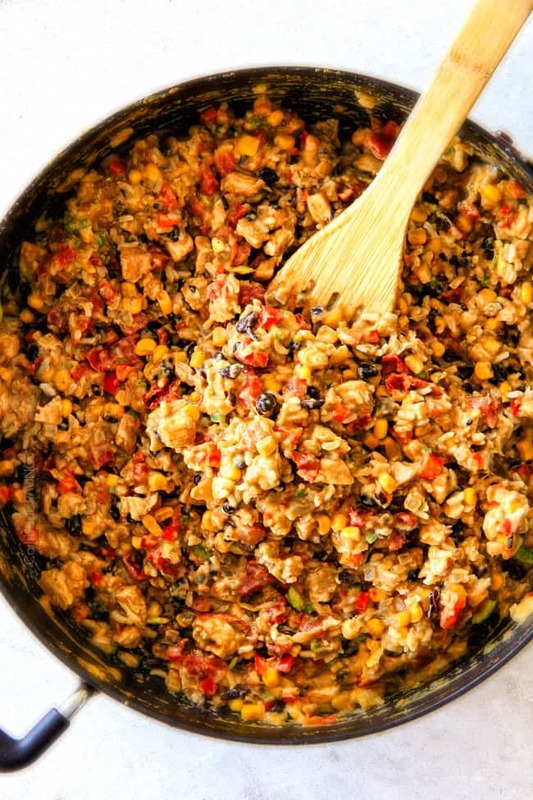 It even would be delicious mixed in eggs to create a Southwest Scrambled Eggs or an omelette. It is also delicious mixed in rice or pasta. Can I freeze Southwest Egg Rolls? if you need an easy bake and serve appetizer that’s homemade and crazy delicious! Prepare and cook Egg Rolls according to directions. Let egg rolls cool COMPLETELY (you can place them on a baking sheet in the freezer to speed up the process). Wrap Egg Rolls individually in foil, then place multiple egg rolls in a freezer size plastic bag. When ready to serve,, either fry as before straight out of the freezer (don’t defrost)), adding about 1 1/2 minutes to freezing time OR Bake as before, adding about 5 minutes to baking time. (no need to defrost first) . Should I bake or Fry Southwest Egg Rolls? You can Bake or Fry these Southwest Egg Rolls BUT fried egg rolls are much crisper which = more delicious. We don’t fry much at our house but egg rolls are one food I make an exception for. Egg Rolls are hands down better fried if you are looking for that tantalizing, shatteringly crispy crunch. They are still crispy-ish when baked and delicious because of the hearty so-good-I-want-to-eat-it-all-plain filling, just a different type of textural delicious. Heat vegetable oil in a deep stock pot/Dutch oven or deep-fat fryer to 350 degrees F or medium high heat. Gently add egg rolls in batches so they don’t overcrowd the pot. Fry egg rolls until golden brown, turning egg rolls a few times while frying. Line egg rolls, seam side down, on baking sheet, so that they are not touching. Broil a minute or so on each side for extra crispiness. 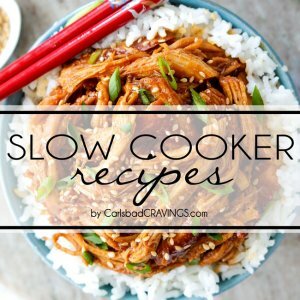 What Dip should I serve with Southwest Egg Rolls? Southwest Egg Rolls are meant to be dipped! 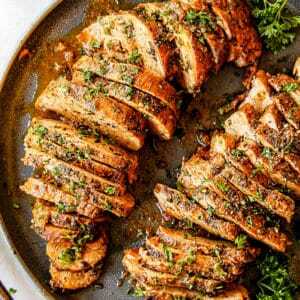 They crispy exterior and hearty filling are begging for a luscious, creamy counterpart, and nothing is better, in my humble opinion, than Cilantro Lime Ranch – don’t skip it! While we may think of Southwest Egg Rolls as an appetizer, more often than not at our house, we leave that to chips and salsa and serve these Southwest Egg Rolls as the main event along with either Cilantro lime rice or Restaurant-Style Mexican Rice, Pina Ccolada Fruit Salad and Churros for dessert! Looking for more Mexican Restaurant Favorites? 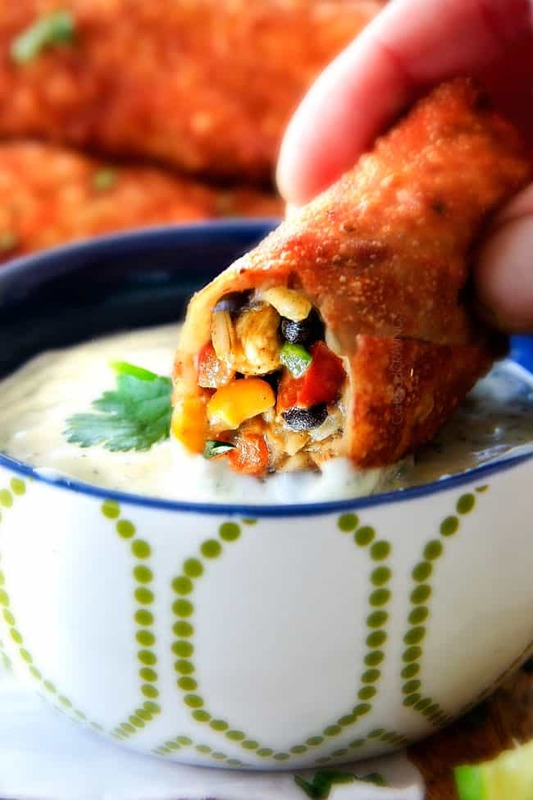 Want to try this Southwest Egg Rolls Recipe? 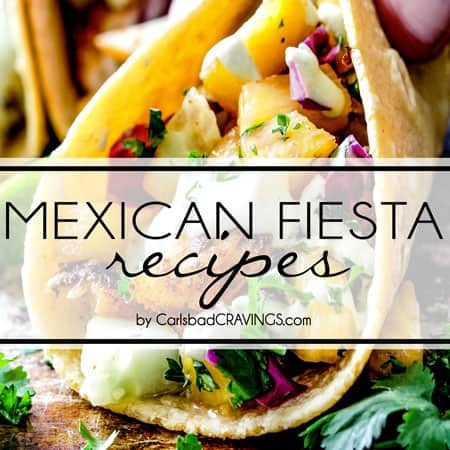 Pin them to your MEXICAN, CHICKEN, DINNER OR APPETIZER Board to SAVE for later! 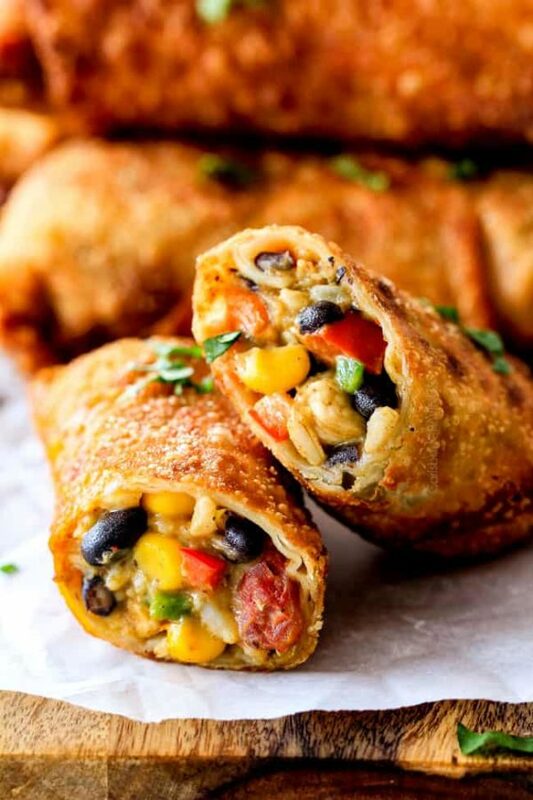 Crispy Fried OR BAKED Southwest Egg Rolls loaded with Mexican spiced chicken, beans, tomatoes, rice, avocado and melty cheese! 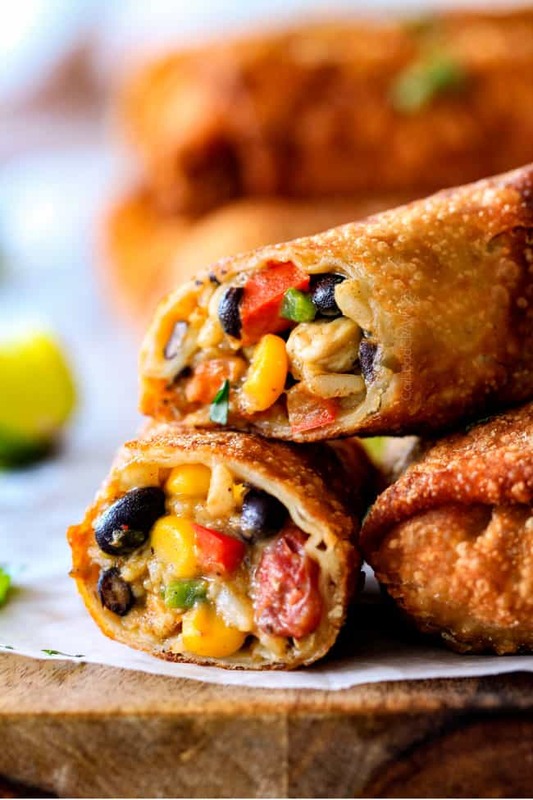 These Southwest Egg Rolls are packed with so much flavor and texture, they not only make a crowd pleasing appetizer, but a scrumdiddlyumptious meal the whole family will love all served with heavenly Cilantro Lime Ranch Dip! 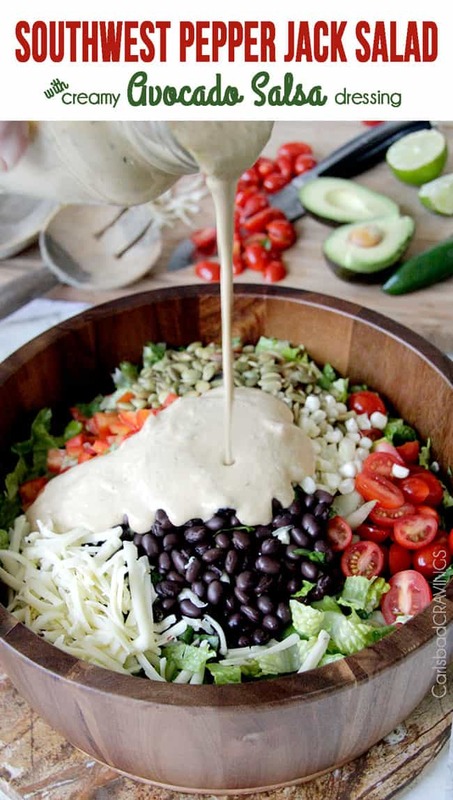 Whisk together all of the Cilantro Lime Ranch Dip ingredients in a medium bowl. Refrigerate. Heat olive oil over medium-high heat in a large nonstick skillet. Add chicken and onions and cook until chicken is no longer pink on the outside. Add garlic, bell pepper and jalapeno and sauté 1 minute. Stir in black beans, corn, rice, tomatoes and all seasonings and cook for 1-2 minutes or until warmed through and chicken is fully cooked. Remove from heat and add cheese. Stir until melted. Add avocados and stir to combine. 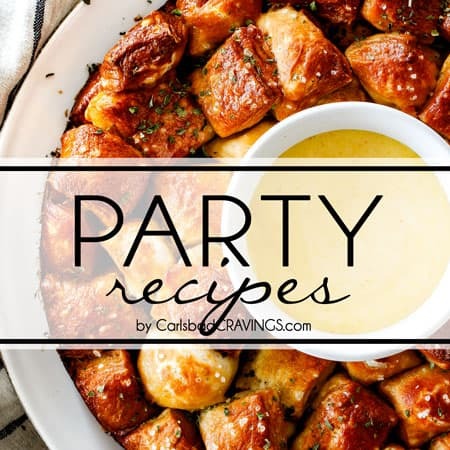 Line your counter with parchment paper to place rolled egg rolls if frying or line a large baking sheet with aluminum foil if baking and lightly spray with nonstick cooking spray. Position an egg roll wrapper with one point towards you. Place 1/4 cup filling centered in the bottom third of the wrapper. Fold bottom corner over filling then continue to roll up, firmly folding sides toward center over filling as you roll. Moisten top corner with water and press firmly to seal. Repeat with remaining wrappers and filling. (Refer to your egg roll wrapper for a diagram). TO FRY: Heat oil in a deep stock pot/Dutch oven or deep-fat fryer to 350 degrees F or medium high heat. Fry egg rolls in batches until golden brown, turning egg rolls a few times while frying. Drain on paper towels. 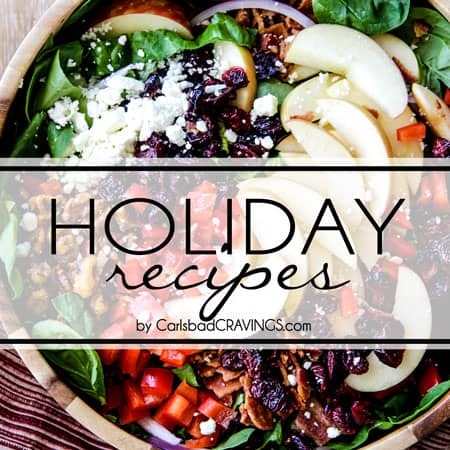 Serve warm with Cilantro Lime Ranch Dip. TO BAKE (not as crispy): Preheat oven to 425 degrees F. Line egg rolls, seam side down, on baking sheet, so that they are not touching. Spray with nonstick cooking spray. 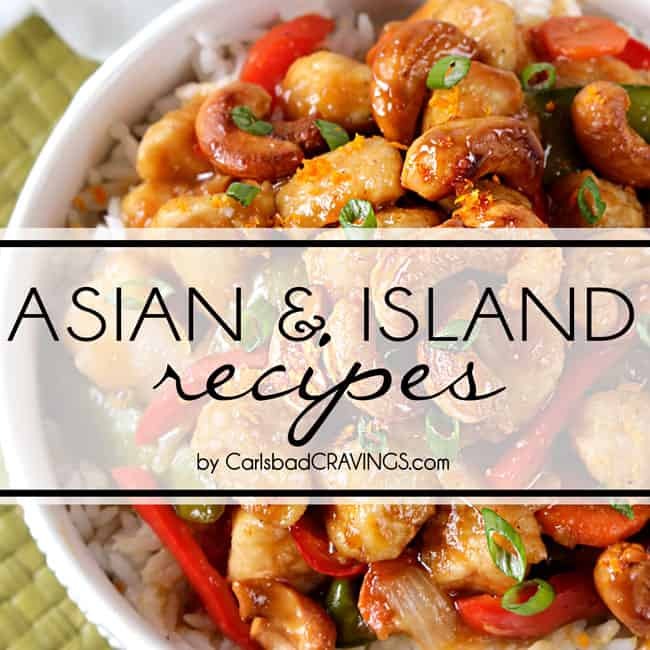 Bake for 10-15 minutes or until egg rolls are golden, flipping 2-3 times while baking, Broil a minute or so on each side for extra crispiness. 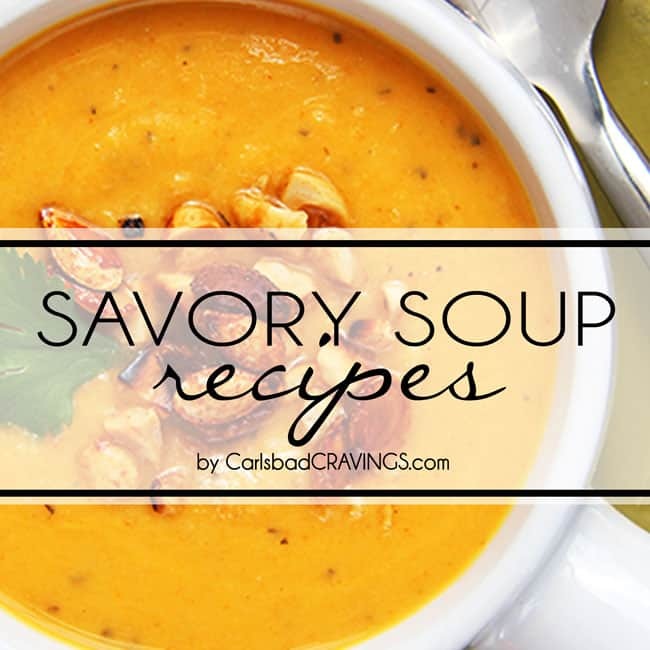 Serve warm with Cilantro Lime Ranch Dip. TO FREEZE: Prepare and cook Egg Rolls according to directions. Let cool COMPLETELY (you can place them on a baking sheet in the freezer to speed up the process), then wrap Egg Rolls individually in foil, then place multiple egg rolls in a freezer size plastic bag. When ready to serve,, either fry as before straight out of the freezer (don't defrost)), adding about 1 1/2 minutes to freezing time OR Bake as before, adding about 5 minutes to baking time. (no need to defrost first) . Thank you Nichole! Cheese makes everything better! and crispy does too! Wonder if you can use Empanada discs instead of the egg roll wrappers? YAY! so happy you loved these Stacey and I love the mini eggroll plan – always a good idea to have more crispy egg roll! Hi there, I don’t recommend freezing them before cooking or they will become soggy. You can certainly freeze them after cooking though and just be sure to cook them from frozen and don’t defrost them before cooking or again they will become soggy. Hope that helps! 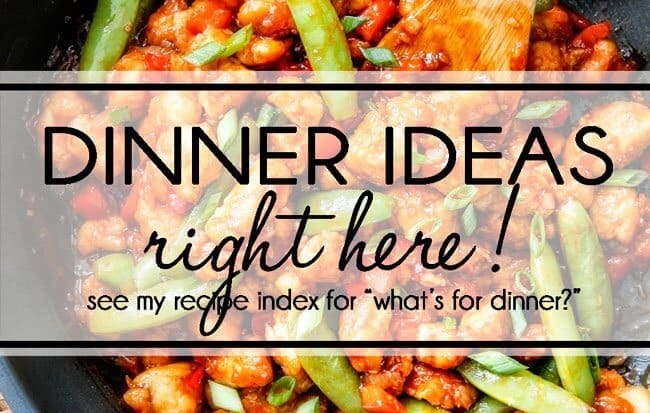 I’ve made this like 5 times already and making it again tonight! 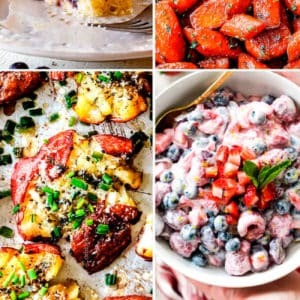 These are awesome 🙂 great recipe ! Thanks for taking the time to comment Kevin! 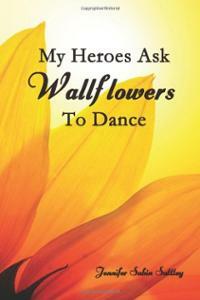 I’m thrilled you love them SO much! Thank you!! !